This fly has a number of parts that are best prepared as a batch in advance. The body is a piece of 1/8" thick x 3/8" wide tan foam. The length should be about 25% longer than the hook shank. Make the cuts at the ends 45° bevels. This provides clearance for the eye for the thread and a bit of a cup for a popping effect with the fly when it is fished. The hook will be stuck through the center line of the body, and the body folded around the shank and initially held with cyanoacrylate glue. The gap filling variety of Zap-a-Gap seems to perform best at this. It also helps to prime the glued surface with the glue and set it aside to cure. The legs are made from the type of rubber hackle in a strip of about twenty bonded together. Split off a double wide strip and cut it into about 2" lengths. Tie an overhand know in it at about the 3/4" point, lubricating it with spit to draw it up very tight. Split the short end below the knot and cut off the piece that make less of an angle with the other section. The wing is prepared by coating it PVC pipe cement and then plastering it to a piece of glass or polyethylene. The cement goes on thick and gloppy but dries thin and tough. Start the thread at the eye and take it to opposite the barb. Form and lock a loop of thread about 6" long as if you were going to use it as a dubbing loop. Take the thread back to about 1/3 the shank length from the eye. Set up the post and parachute hackle feather, but don't wind it. Take the thread to the eye. Put a hole through the centerline of the foam about 1/3 of the way from the end. Take the hook out of the vise and put it through the hole such that the primed side is to the hook shank and beveled end at the eye is up. 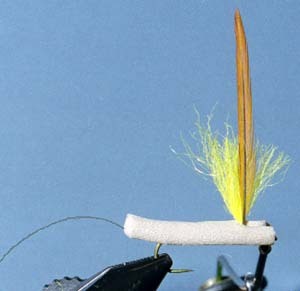 Spread a thin layer of Zap on the foam and fold it around the hook shank. The stuff should set in about 15-20 seconds. Make sure the thread loop comes out the back end as shown in the picture. Take care to keep the eye clear. Using the thread loop lace the body into segments with a series of cable hitches. This a kind of half hitch such that the thread comes out underneath so it's self locking. Pass the thread from hitch to hitch along the top. A crocheting hook is helpful for doing this. Tie off the loop at the hitch behind the post by putting a little Zap on it, wrapping it a turn or two, and holding it a few seconds. Form the front segment with the tying thread and bring it back to the hitch behind the post as shown in the picture. 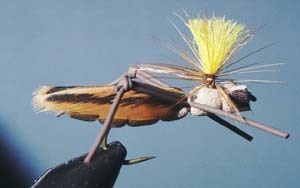 Trim and tie in the feather wing and the legs as shown. The knots in the legs want to be about even with the bend of the hook. 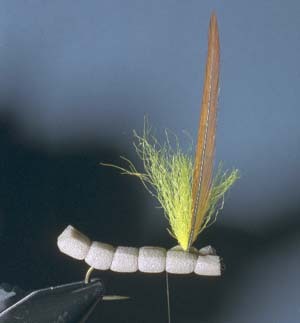 The doubled rubber hackle resists rotating when it is tied in. It also helps to take a locking wrap or two behind the legs where the thread passes over them. Split the front section and cut off the upper piece--not too close to the thread or it may slip under. Take a wrap around the post and let the bobbin hang. 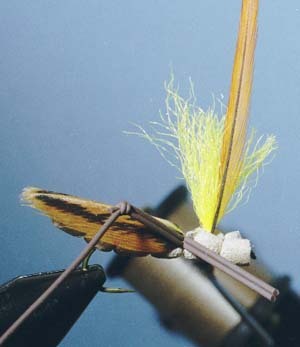 Wrap the parachute hackle around the post in the standard way--top to bottom. Then take two or three wraps of the thread around the post through the hackle to secure it. Finally take the thread to the eye and whip finish or anchor it with a drop of Zap. 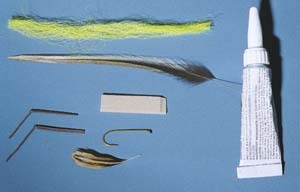 Trim the hackle and the post and trim the legs so they are the same length. Paint a black eye on either side of the head and your are done.